When super spy Harry Hart loses a member of his team in the late 90s, he makes a promise to look out for the young son of the man who died trying to save him. Seventeen years later, Eggsy is a wayward teen with a permanently distraught mother and violent scumbag of a step father. When Eggsy is arrested for stealing a car, Harry Hart seeks out the troubled youth and offers him the chance to become a part of the mysterious and super secret spy agency known as the Kingsman. 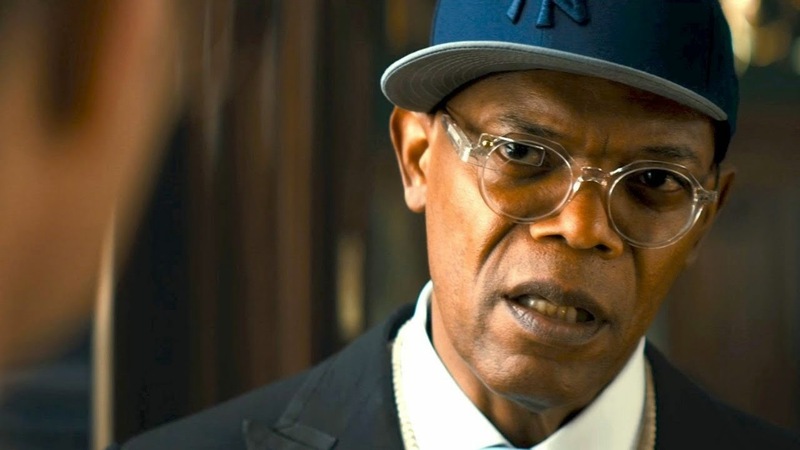 Seeing what Harry Hart can do, the gadgets he uses, and the class he oozes, Eggsy agrees to sign up to the competitive training regime that could see him taking on billionaire lisping megalomaniac Valentine (Samuel L. Jackson). It is very clear from watching Kingsman that director Matthew Vaughn is not ready to give up on directing a Bond film yet. Whether he will ever get the gig in the future on the back of this film is very questionable. 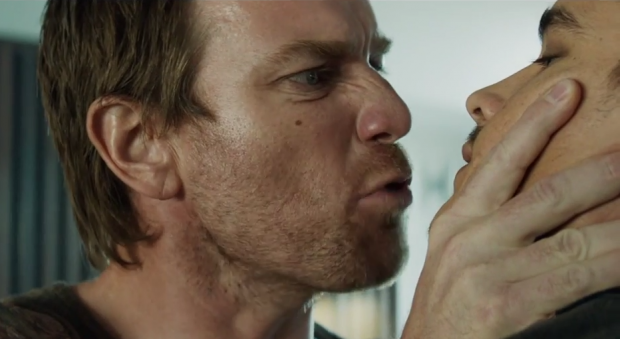 Kingsman is more like the film we would get if Tarantino ever gets to make a Bond film. It’s self-referential and smart, has a brilliantly foul mouth and is uber-violent from start to finish. Not to mention the fact that it takes an outsider’s perspective on Britain and fills the film with stereotypes of the class system, from the stiff upper lipped suited gents of the Kingsman to the ‘yeah bruv’ yoof of working class ladland. Early contender for best scene of the year? Kingsman takes great pleasure in pinching from Bond films, while giving tradition a good shake up. Valentine’s lisp, blade footed hench-woman and mountain lair all feel like they border on homage and parody, whereas other moments indulge in characters talking conventions before shockingly subverting what audiences have come to expect in these films. To take the Tarantino comparison further, Matthew Vaughn really knows how to revel in the joy of a good splash of ultra-violence. 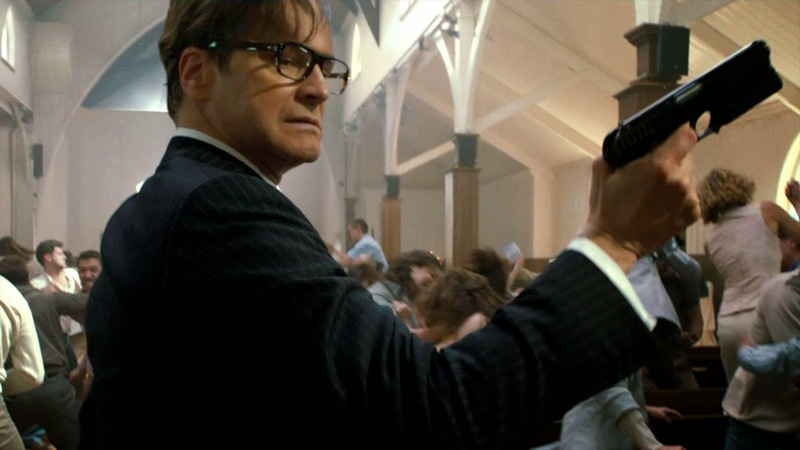 The scene where Firth’s skilled spy is unleashed on a church congregation to the sounds of Lynyrd Skynyrd’s Freebird is one of the most excitingly executed, thrillingly shot and edited and funniest massacres in film history. Nothing in the rest of the film can touch it, but that doesn’t stop Vaughn from trying. With its cast including Colin Firth, Mark Strong, Michael Caine, Samuel L. Jackson and Mark Hamill, it’s a wonder that Taron Egerton even gets a look in as Eggsy. Doubters may think that he is a poor man’s substitute for the swagger and savagery of Jack O’ Connell but Egerton emerges as a winning choice to hold the film together, charming with his sly grin and convincing with his way with an umbrella. Though there is a worrying undercurrent of upper class superiority and even scepticism about those who campaign about climate change, if you can cast those niggling fears aside, there surely won’t be a more gleefully violent film than Kingsman this year. San Fransokyo teen Hiro uses his technical wizardry to hustle his way to winning in illegal robot fighting matches. His brother Tadashi recognises Hiro’s genius for robot building and encourages him to take up a place at the ‘geek school’ for tech whizzes where Tadashi has built huggable big nurse ‘bot Baymax. When a tragedy befalls Hiro’s family, he must band together with Baymax and other allies from the school to take on a mysterious masked figure who is using Hiro’s microbot invention for his own nefarious purposes. This Marvel-Disney mash-up looked insufferable from the brightly coloured and barely coherent trailer so it is a pleasure to report that Big Hero 6 is a surprisingly heartfelt and exciting family movie. 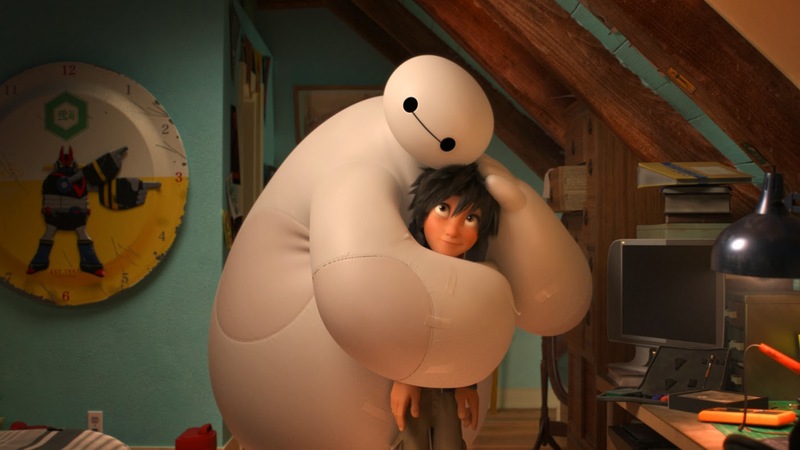 Baymax might look designed to simply sell a shed load of merchandise, but he is actually the film’s true wild card. While the rest of the characters pass by in a blur of colourful enthusiasm, but will linger as long in the memory as the flavour of bubblegum lasts, Baymax really is a keeper. It is amazing how much the big ‘bot manages to swipe your heart away, even if many of the best moments are half swiped and rejigged from the poignant moments between the young John Connor and his robot pal, the T-800 in Terminator 2. Nevertheless, it may not be hugely original but Big Hero 6 is the most exciting animated action film since The Incredibles. When Hiro and his team face off against the villain, the stakes are high, but more importantly the idea of revenge makes Hiro himself into the most riveting character on screen. There are huge set-pieces, some decent laughs, but the best thing about Big Hero 6 is the ultimate question of whether Hiro will really be a hero or if his thirst for revenge will get the better of him. Most impressive is the fact that Big Hero 6 balances its origin story perfectly with the introduction of its super-villain. There might be some awkward exposition to begin with, but its snappy enough that the story pieces together like a well constructed robot with a heart as big as Baymax’s. Private investgator Doc Sportello goes through life bare-footed and permanently sucking on a string of joint after joint. It’s 1970 and the Manson murders are a very recent bitter memory in an era where the peace and love of the hippies is giving over to the paranoia of those who always had their sneaking suspicions about the long-haired, soap-dodging flower children. Doc gets a visit from his ex-lover Shasta who informs him that her current boyfriend (rich and married) is about to be targeted by his wife and her lover in a bid to get him committed so that they can steal his money. So begins Doc’s investigation that brings him into contact with LA’s scuzziest inhabitants that include an all-star cast from drugged up dentists (Martin Short) to slightly psychotic cops (Josh Brolin). Inherent Vice is a breath of fresh air after the oppressiveness of Paul Thomas Anderson’s last, The Master and the gloomy juggernaut of There Will Be Blood. Joaquin Phoenix is a revelation as the shambolic PI who mumbles his way through the film in a constant daze. With so many stoners on show, the pace sometimes seems to slow to an almost complete halt. You feel like shaking some of these hippies out of their stupor and shouting at them to snap out of it and get on with the story. In that respect, Josh Brolin’s flat topped cop is a welcome relief, whether simply ordering more pancakes or attempting to kick Doc into shape. But really, the pleasure of Inherent Vice isn’t in the investigation. Most of the film is simply a series of conversations between Doc and a revolving door of oddballs. So Phoenix’s performance is a constant source of humour, even if you completely lose track of who is shafting who, who has disappeared and reappeared and what exactly Doc is even investigating. Beyond that, the enjoyment of Inherent Vice comes from being transported into a very specific time and place. It's got a great soundtrack and a hilariously spaced out voice-over running through it. It’s the kind of movie where the smoke seems to come right out of the screen, making you feel all misty eyed for an era you may have never even experienced. Doc is a slacker hero to rival The Big Lebowski's The Dude and with its hard-to-follow narrative, Inherent Vice is liable to leave you feeling just as drug addled as its protagonist. Over the weekend, we had the Producer's Guild Awards and the Screen Actor's Guild Awards announce their winners for the past year of film making. At the PGA's, the producers of Birdman, The Lego Movie, TV's Breaking Bad and Fargo won the big prizes while there was a fascinating spread of movies that won at the SGA's. Below I have listed the nominees (for the movie categories) and in bold are the winners. 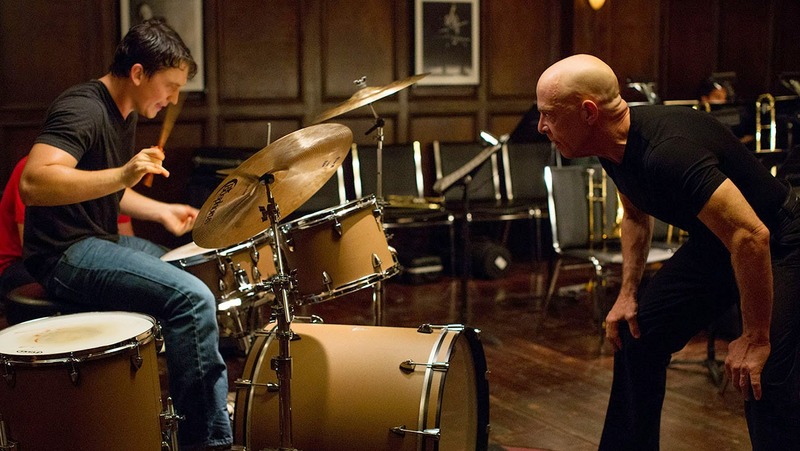 Not one movie had two winners, meaning that The Theory of Everything, Still Alice, Whiplash, Boyhood and Birdman all picked up awards. It's great to see all these films picking up something and it will be very interesting to see if this is repeated at the Oscars.